I found the ShoeDazzle website one day and instantly fell in love. Any girl, especially any shoe lover would absolutely adore this site. It is your personalized shoe stylist at your fingertips. They also have handbags and jewelery! You take their style profile quiz which only takes a few minutes so they can get to know your style. Based on your style profile, their fashion experts (one being Kim Kardashian) create a selection of 5 shoes, handbags and jewelery for you each month. You pick which one you want and for $39.95 a pair of shoes will be mailed to your doorstep. If you don’t like the selections for that month you can ask for an alternate selection. If you live in the United States the shipping is free, if you live in Canada the shipping is $9.00. Which I find extremely cheap. How can you go wrong for a pair of shoes for under $40-$50 depending on where you live. There is no obligation to purchase once you register. You are charged only after you place your first order. If there is a month you don’t want to buy anything then you just click “skip this month” between the 1st and the 5th of the month and you will not by charged. If you are charged then you will have a credit and can use it another time. 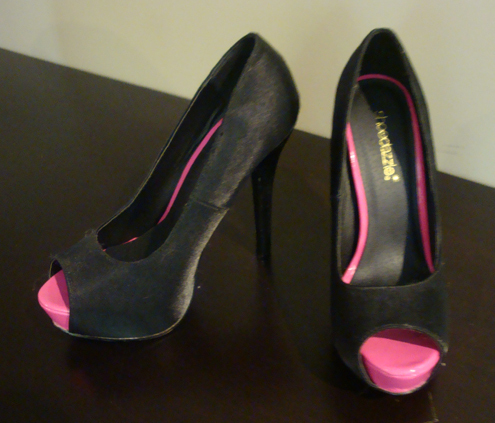 To make it even better ShoeDazzle has just recently introduced Style Points. So you earn points when you make a purchase or win a contest and can eventually get free shoes! I’ve ordered shoes and love it! The shoes arrived at my doorstep in less than a week, and I’m in Canada. I have not had any problems and they have an easy return system. I had to skip this month though because of my budget! But hopefully I won’t have to skip next month. CLICK HERE to sign up to ShoeDazzle for free. Or if you have already tried it out comment below and let me know how you like it! Here’s my favorite pair that I’ve purchased so far. I absolutely love them! !